Art Appraisals of Santa Fe owner, Michael Ettema, appraises American fine and decorative art and antiques, and Native American arts of the Southwest. Your appraisal will be tailored to your individual needs, conducted with professionalism, and delivered in a timely way. 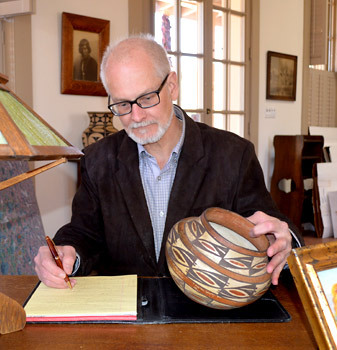 Michael Ettema is a member of the International Society of Appraisers (ISA) and has 29 years of experience with American fine and decorative arts and antiques as a museum curator, educator, and director. In addition, he has ten years of experience with Native American art and fine art of the American West as Santa Fe Director of Medicine Man Gallery, Inc.
Michael’s education and experience as both scholar and dealer means that your appraisal will meet the highest standards of the profession. He will correctly identify your property, compile accurate market data and analyses, and provide objective value conclusions. Because AASF’s appraisals comply with the federally mandated Uniform Standards of Professional Appraisal Practice (USPAP), the Appraisal Report Writing Standards and Code of Ethics of the ISA, and all requirements of the IRS, you can be sure that your personalized appraisal is defensible under scrutiny by insurers, the IRS, and the courts. You also can be sure that Michael will help you manage your collections and collecting ambitions with a clear-headed professionalism that will put your mind at ease and help you truly enjoy your collecting adventure. Call or email today for a free consultation. Michael was a wonderful discovery, teaching us about the great Indian Potters, their techniques and history. His customer service and wise counsel are superb and he is a truly knowledgeable professional who really cares about his clients. In my dealings with Michael Ettema over the past few years, I have always found him to be very helpful, extremely knowledgeable and – perhaps most important – an honest and genuinely nice guy. Ann and I would never consider a purchase of Indian pottery, a blanket, or old jewelry in Santa Fe without having Michael look at it and give us his recommendations and approval. Michael Ettema is an incredibly knowledgeable and wonderfully personable expert in his field. In other words, a consummate professional. And one whose judgment we value very highly. 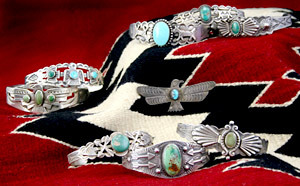 AASF offers three areas of specialty: Native arts of the southwest including rugs and blankets, pottery, Indian jewelry, baskets, Kachinas, paintings and sculpture; American fine art including paintings, prints, drawings, and sculpture; and American decorative arts including furniture, silver, ceramics, lighting, and folk art.